“The new arc of No Mercy is just as bloody as the last, and widens the tension out to bring in families, the school, and Sister Ines' extremely dodgy relatives,” said de Campi. “One of the things we're proudest of with No Mercy is keeping the tension ratcheted up all the way throughout this arc (which goes through Issue #9) as we learn more about these teens, a few of them are saved, and a few of them get themselves further into danger. And one, who won't live past Issue 6.” "Readers are gonna get some of the moments they've been hoping for in this next arc. They just might not happen to the people they expected, that's all..." added McNeil. "Believe it or not, even more drama gets introduced, with even more ramifications than falling off a cliff,” said Lee. 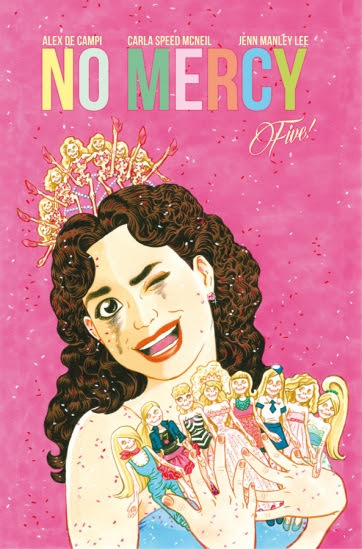 NO MERCY #5 hits stores Wednesday, December 9th.